An MTA employee seen in a video dragging an unresponsive subway rider has been removed from service, officials say. Commuter Claude Harris, 38, captured the scene on his phone at the G train Church Avenue stop around 9 p.m. on Monday. Harris told the Daily News, which first reported the story, that a man was asleep in the last car as the train pulled into the station. After Harris unsuccessfully tried to wake him, an MTA worker aggressively stepped in. "He immediately grabs this guy, throws him down to the ground and starts to drag him," Harris told the News. Later, a second MTA worker can be seen entering video -- calling the other worker "Jenkins" and telling the man on the floor, "Amigo, over here!" 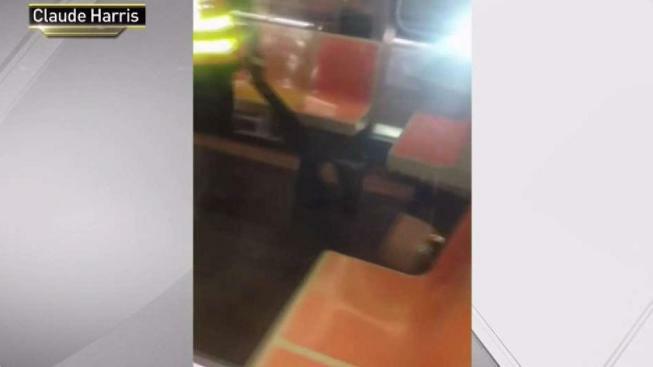 MTA spokesman Shams Tarek told News 4 on Tuesday night, "This footage is clearly disturbing and the employee in the video has been removed from service while the incident is being investigated." Harris, who decided to post the video to social media, agreed. "This guy didn’t do anything," he told the News. "You didn’t give him a fair chance."